The set cream dessert is so simple and it's wonderful with lots of different fruits. Just choose whatever looks good and is in season. 1. Soak gelatine in cold water until soft, remove excess water. 2. Bring 600ml cream to a gentle simmer. Remove from heat and add 60g sugar and gelatine. Whisk until gelatine is dissolved. 3. Add rose water and orange-flower water then pour through a sieve into a 1-litre serving dish. Chill for at least 4 hours. 4. About 30 minutes before serving, combine strawberries, 3 tbsp sugar and brandy, stirring until all the sugar has dissolved. 5. 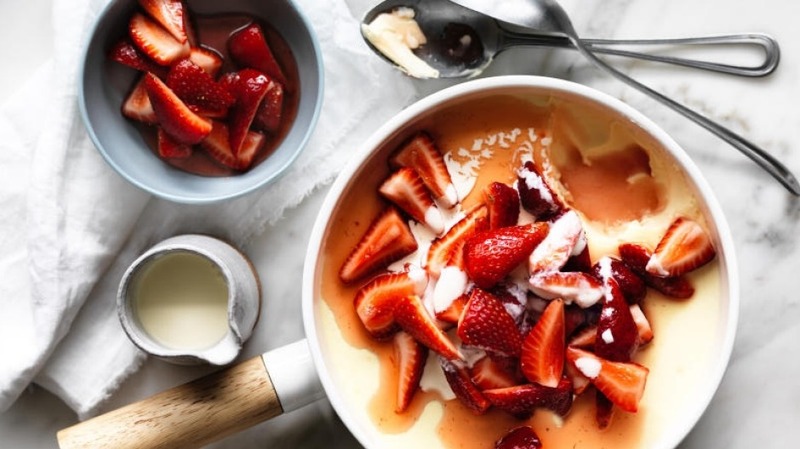 Spoon strawberries over set cream; drizzle with remaining pouring cream.